What is Better off Bowling? BOB started as a fun way to hang out with friends and meet new ones, and has stayed true to that goal ever since. 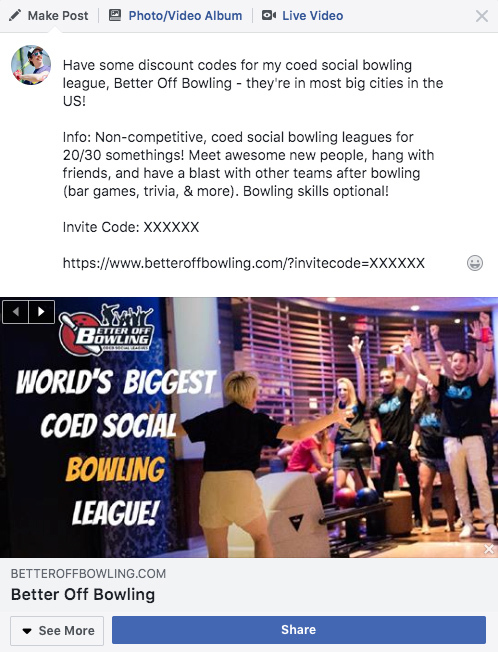 The 6-week coed bowling leagues let members socialize as they bowl each week, with added fun like league-wide team trivia or photo contests so they can meet the hundreds of other fun 20/30-something bowlers as well! 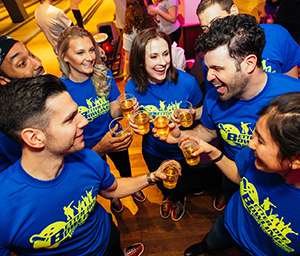 Once bowling is over, most players head to the after-bowling bar to hang out with the rest of the league over beers, bar games, sports on TV, and other fun. 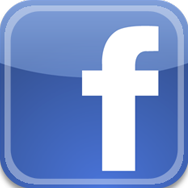 More than a bowling league, BOB is a massive social community that has created friendships, marriages, and more. 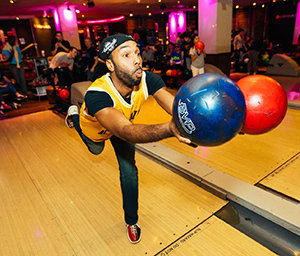 Bowling skills, as always, are optional. To learn more, scroll down for more BOB info & photos or click on a season to get signup details! “ After graduating it was tough to find time to see my friends because of everyone’s crazy schedules. We signed up for BOB as way to get us all together each week and we now bowl in the Sunday league every season! “ I joined as a free agent and was placed on a team with a girl named Jessica for the winter season. We got to know each other during the post-game bar hangs. Fast-forward a year and a half and we’re now engaged! 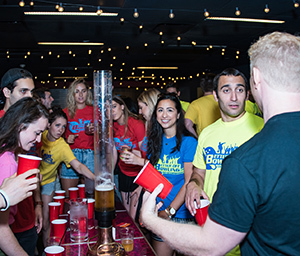 “ My company put together a team as way to have some fun and get to know people after work. We ended up meeting a ton of other people in our industry – way more fun than any networking event I’ve been to! “ I had a blast at BOB! A few friends had moved away and I wanted to meet new people outside of work. 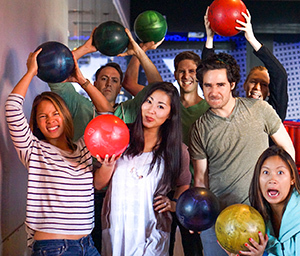 Bowling was perfect – it was packed every Thursday night after bowling and we closed down the bar a few times too. No more boring weekends! 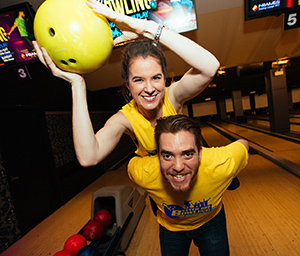 Meet hundreds of fun new people with different interests and social circles, all while rolling a few bowling balls and hanging out at the after-bar. 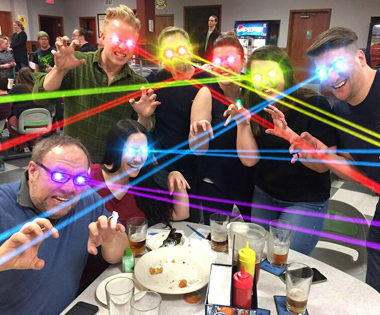 Meet people face-to-face and get to know them over an entire bowling season rather than a tinder profile. No ghosting, online meat markets, or super awkward first dates. What better way to kickstart your social life when you’re new to a city than getting introduced to a massive social community? Sign up as an individual and you can join a team or get put with other free agents! Everyone gets busy and it can be tough to find the time to get the gang back together. Solution? 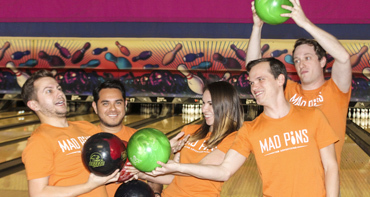 Setup a casual bowling team for drinks, bowling puns, and a great after-bowling bar scene every week! BOB is as competitive as you want to make it, but it’s always super social! Whether you’re a gym class all-star or a bowling newbie just looking for a fun activity, BOB is a great fit. 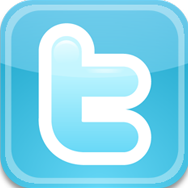 Looking for an after-work activity that everyone can participate in? Setup a BOB corporate team and build an amazing corporate culture as you get to know your coworkers! 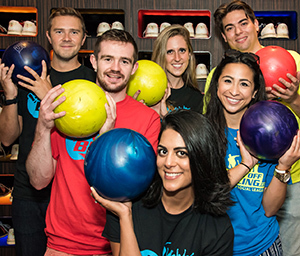 Bowling is always a good time, but it’s the trivia and after-bowling bar scene that makes BOB’s leagues so social. 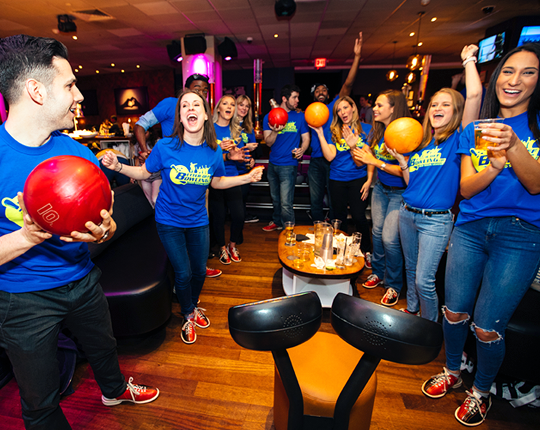 During bowling you’ll be paired with your opponent for trivia, competing against everyone else, which is a great way to actually get to know the people across the lane! Afterwards, everyone heads to the after-bowling bar to hangout and socialize over a few drinks. 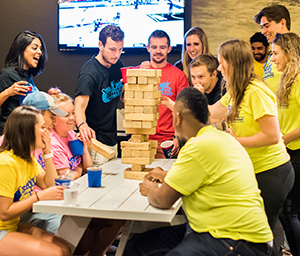 With bar games like flipcup or pong, board games like Cranium or Cards Against Humanity, there’s something for everyone, along with the games on TV. 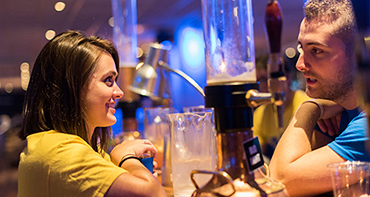 Come out for bowling, but stick around for the fun at the bar! One of the best ways to get an idea of what BOB is about is to check out some of the league photos. 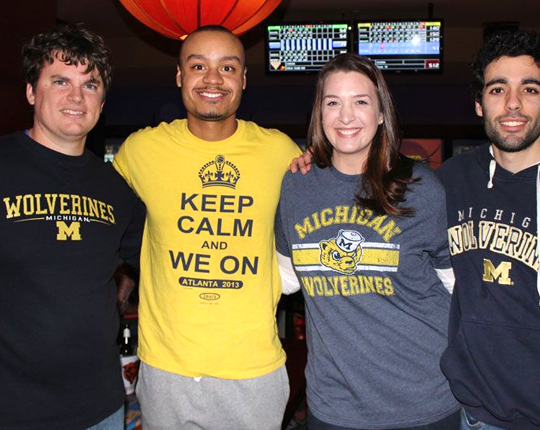 From bowling, to trivia, to games at the after-bowling bar, click through a few photos and then get some more info on upcoming seasons below! 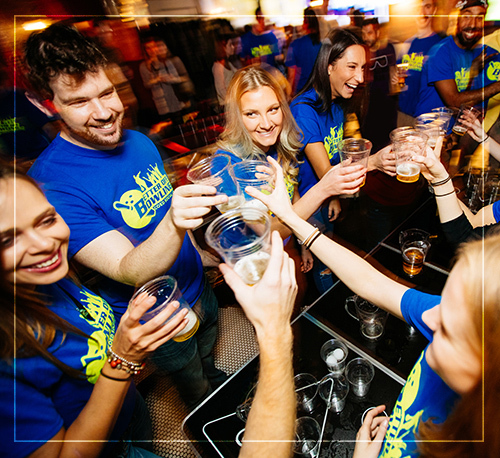 BOB’s corporate signups give companies the opportunity to take teambuilding to the next level. 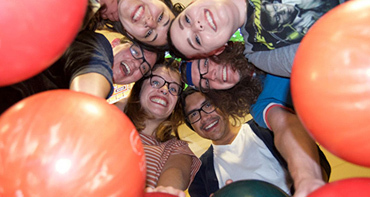 Unlike some activities, bowling offers the perfect opportunity for coworkers of all ages and competitive levels to get together and build some team connections. You can setup one or more office teams, and BOB always makes sure the teams play each other and those in the same industry. Studies have found that keeping employees engaged in their work and forming team bonds has a profound impact on employee retention and productivity, so it’s a great sell to HR dept too! 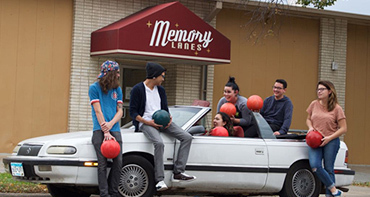 Unlike other sports which might leave some members feeling left out or uncomfortable with the level of competition, anyone can bowl, and since only the top 4 scores count, even if you’re a terrible bowler you won’t hurt the team. 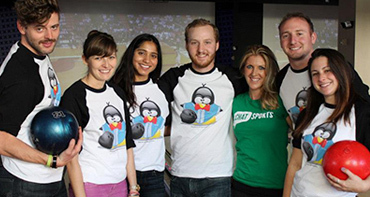 Be an office hero and get more info on corporate teams below to see what you can do to get the ball rolling! There’s no better way to get your alumni network engaged than getting everyone hanging out and meeting each other on a regular basis! 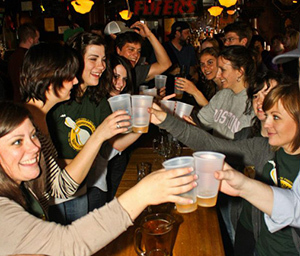 Happy hours are great, but can get old and require a lot of work and money coordinating with the bars, guaranteeing space, and making sure people show up. 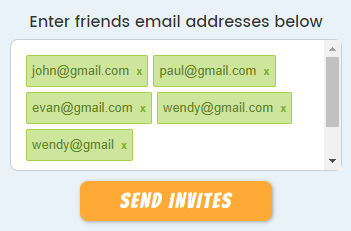 With BOB, you can just setup a team and send out a link to the listserv – and you only need 6 people minimum! You can sign up as many teams of 6-10 as you like, and pay for them or have individuals pay! 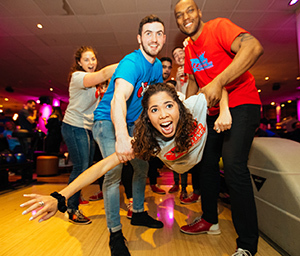 Even more importantly, unlike other sports, everyone can bowl, so regardless of age or skill-level, all members will have a great time! 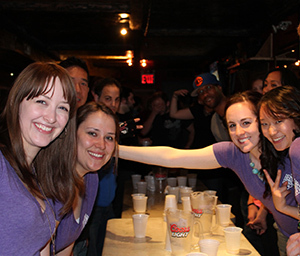 Sign-up a team, then get ready to roll against other alumni groups or rivals! Click on the link below to get more info on setting up an alumni squad! 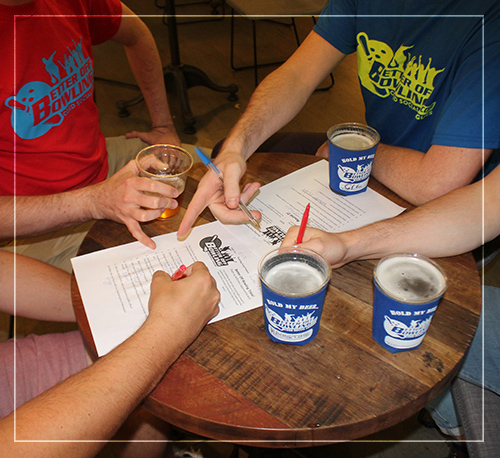 Signing up for a BOB league is a breeze, but how does it all work? Once you pick a season and register, you’ll be able to join a team, find a team, or start one. 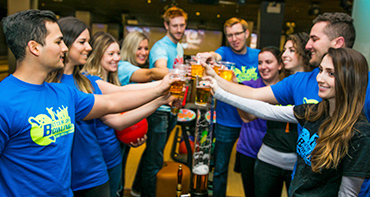 Then you’ll get email when registration closes letting you know what team you’re on and when to show up for bowling! For more details, see what to expect below. To get started you'll first pick a league and register for the season. You can do that by going to "Find A League" menu up top and choosing your city. Then click register and pay for the season you'd like to play in. If you have a team you'd like to join, you can then join that team once you've registered. Or, you can start a team and invite friends, join as a small group, or join as an individual and get paired with other free agents! Around a week before the season starts, registration will close. Sometimes if a season sells out, registration will close before that - so if you plan to join, make sure to do it early while there are still spots. Once registration closes, all teams and individuals get sorted to make sure everyone has an amazing team! Teams without the 6-10 required players will be moved around to make sure they are eligible. Typically the teams will be finalized soon after registration closes, and then will be sent out to the league. The season schedule is sent out after teams are sorted so people will know when and where they are bowling. 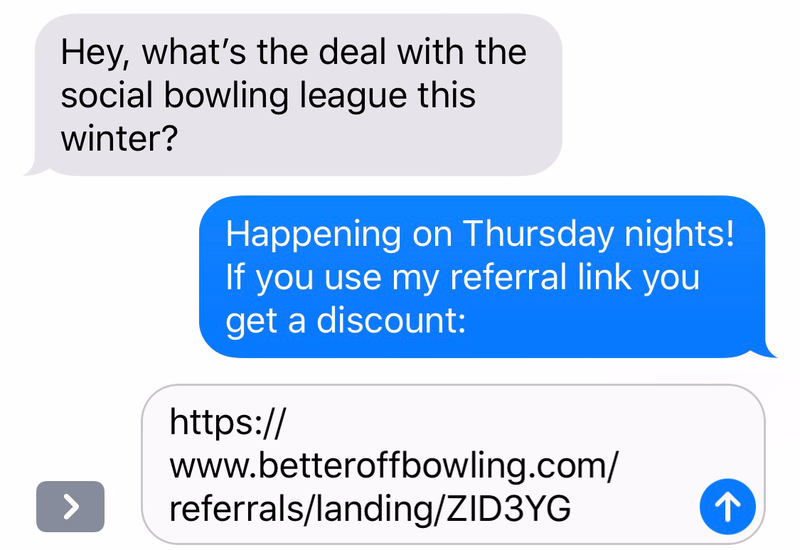 Once the schedule is set, all members will get a welcome email with schedule details and bowling info. If you register 10 days before the season starts, you should get your free BOB bowling shirt on the second week! Late registrants may or may not get a shirt, depending on shipping logistics. 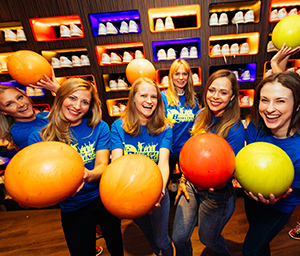 The first day of bowling you'll show up ~15 mins before bowling starts so you can grab shoes and find your lane/team. The BOB rep will come by to say hi and answer all questions! After-bowling is over each week, most leagues hang out at the after-bowling bar either at the alley or a different location with fun team games like Cards Against Humanity and drinks! After each match, a designated captain will either grab the score printout from the front desk and then enter them in before matches close 3 days later. Every team makes the playoffs and they're played just like a normal week, except each team plays their closest rival, and #1 and #2 ranked teams battle for the championship! Meeting my future husband…at bowling! 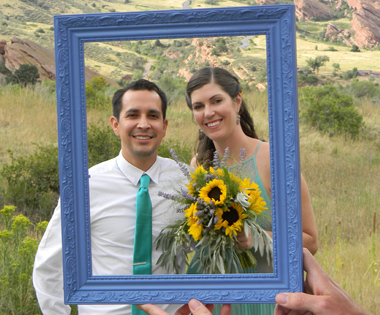 I joined BOB as free agent since I just moved to Denver and didn’t know a single person - I was looking for league that wasn’t serious and mostly just to meet new people! Alfonso was my team as well and we met the first day of bowling. Fast forward a few years and we’re expecting our first baby! Just moved to NYC, Time to make some new friends! Even though there are a zillion people in New York city, actually connecting with someone is pretty tough. 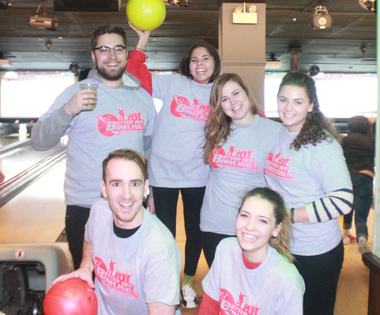 I moved to NYC knowing nobody so I signed up for BOB and ended up meeting my entire circle of friends at bowling. None of us were all star bowlers so there was no pressure to be good. We’re still hitting the lanes on Sundays and still terrible bowlers! 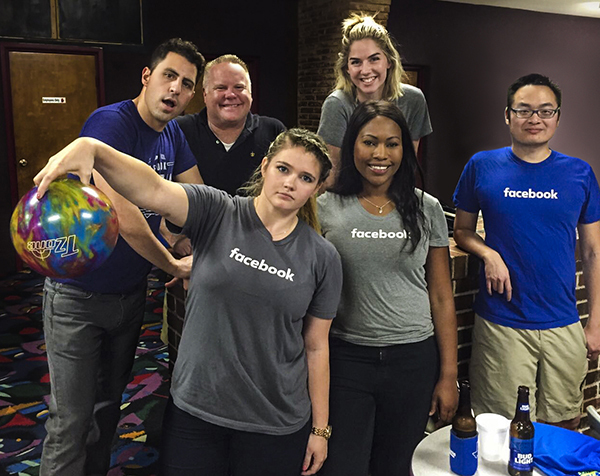 My boss was looking for a fun sport that everyone in the company could play even if they weren’t the most athletic and bowling was perfect for us. 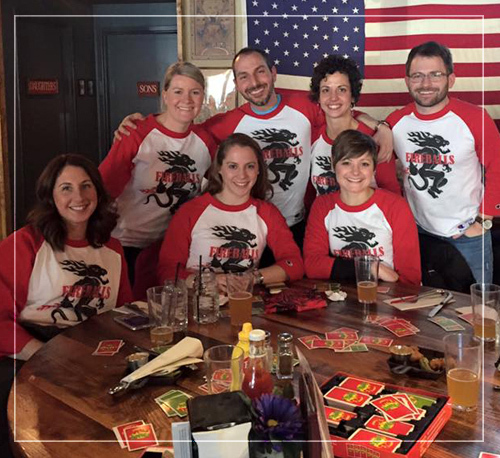 We signed up 8 teams for BOB since our company is in several different locations around Denver so teaming up with the other offices to play trivia and bar games was an easy way to get to know everyone.